The letter sent to Markaz Ul Islam in southeast Edmonton this week contained phrases such as, "We will continue watching you." But even with such threatening statements directed toward a religious community, it can be hard for police to prove a hate crime or hate-motivated crime occurred, legal experts say. The letter sent to Markaz Ul Islam in southeast Edmonton this week contained phrases such as, "We will continue watching you" and, "Adapt if you want to stay." 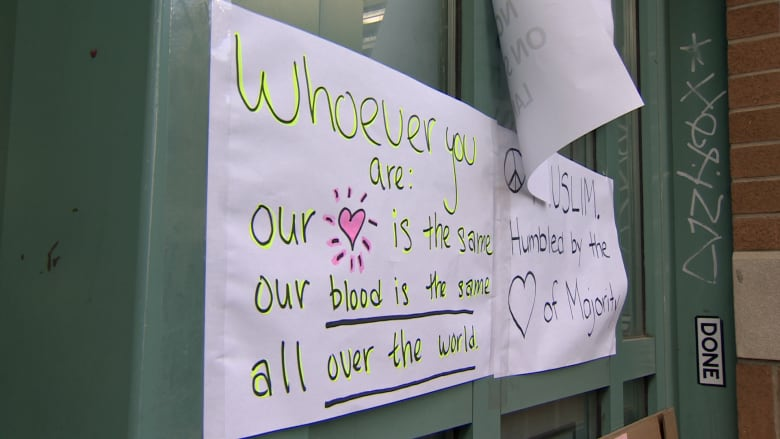 But even with such threatening statements directed toward a religious community, it can be hard for police to prove a hate crime or hate-motivated crime occurred, legal experts say. "The public often believes that something constitutes a hate crime or offence, and while it may very well be construed to be hateful in nature, it's still something that can be allowed under our Charter of Rights and Freedoms as free speech," said Sgt. Marco Lou, the RCMP hate crimes coordinator for Alberta. The Criminal Code includes three offences that may colloquially be called "hate crimes." Those offences include disseminating hate propaganda that advocates for genocide, making public statements that incite hatred of a specific group, and causing mischief at a religious institution. But the thresholds to prove those first two offences are very high, says Lou, and such charges are rarely laid. "The amount of evidence that's required to meet the threshold, it's not easy to cover that." It's more common that police might consider whether a crime is motivated by hatred for a group. For example, someone who threatens assault — and has racist motivations for doing so — can be charged with uttering threats. Police could classify the incident as a hate-motivated crime and a judge could consider that factor in sentencing. But, the offence wouldn't fall under "hate crime" legislation in the Criminal Code. Even proving that level of intent can be difficult for police, said Lou, who can't recall dealing with such a case in the past year. Still, police will search for evidence of intent, including combing through a suspect's social media feeds and scrutinizing the language used in the commission of an offence. "All of those things can ultimately come together to build that case of the hate bias motivation," he said. People who spread hateful messages often know there is a fine line between exercising their right to free speech and violating the Criminal Code, said John McCoy, executive director of the Organization for the Prevention of Violence. "A lot of groups know quite well how to walk that fine line, to get their message out there without contravening legislation." He noted that Oregon recently enacted legislation that makes "ethnic intimidation" an offence if someone tried to intimidate or harass someone because of that person's race, colour, religion, or national origin. But Faisal Bhabha, an associate professor at Osgoode Hall Law School at York University, doesn't think legislation is necessarily the best way to combat hate. "The courts should convict people for assaults, and murders, and other crimes. And society should condemn certain acts that appear to be driven by hate. And the best response is for society to respond with acts of love and solidarity," he said. "I think a far more powerful response to hate motivated crimes against mosques or other religious institutions, should be for other communities and faith groups to come and show solidarity. "I don't think the response is for the police to go on an arrest blitz or to give police more powers. The police have all the powers they need. We don't need more crimes, we need more social responses to those events." He said that when groups started picketing and protesting at mosques in Toronto a few years ago, there were some demonstrations of solidarity, where multi-faith groups showed up to encircle mosques and protect those attending from the attacks. "Individuals and groups need to come together and ask themselves whether they're doing enough to address this problem." Arif Ali, the president of Markaz Ul Islam, said that after news broke that a hateful letter had been sent to his mosque, other packages started arriving, too. "Dozens of people have dropped off flowers. Even people of other beliefs have dropped flowers and messages and wishing cards," he said.